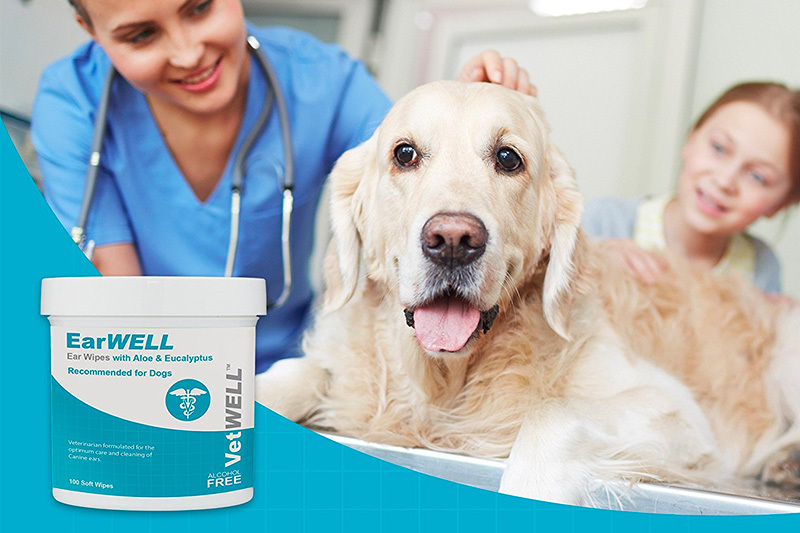 Although pets are part of our family, having them can be joyful and stressful. We may feel good at first when they follow us anywhere we’re going, but soon we will realize we’ve made a big mistake. The more they spend time with us, the more they depend on us. Pets that are too reliant on their owner are more likely to have separation anxiety or become their beloved person’s bodyguard (growling or snapping when someone else comes close). It’s essential that we teach them to be on their own. One of the best ways to teach your pets to be independent is to isolate yourself from them sometimes by using pets gate. Keeping them in the gate, while you’re working can give you peace of mind. It means that you can concentrate more on the work or task you’re doing rather than taking care of them at all times. Keeping them in the gate can also prevent the chance that they destroy furnishings and household objects when not supervised. Because pet gates enable you to limit them to one area in the house where they can wander around. This is much better than crate them all day in the cage, as it allows them to have some activities. Moreover, pet gates are convenient for pet owners because they can easily lock and unlock into/from any places. If you’re interested to buy pet gates for your pets. 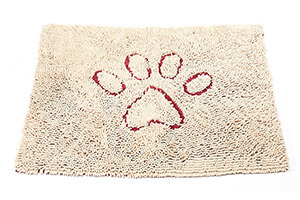 Here are the 10 most recommended pet gates that you may not want to miss. Get more information about each gate below. Raise your hand up if your pets often destroy your furniture and other stuff in the house; especially, your beautiful garden which you have tried so hard to decorate is usually destroyed by them. In contrast, you cannot hit them, punish or do anything to them because you love them so much. You try to find solutions but can’t think of any right? Today, we come up with an easy solution which makes your life a lot easier. The best way to prevent your pets from doing all these disasters is to use the pet door. Your pets only behave well in front of you but when you are out of sight they will use all the energy they have running around the house and destroy anything that they feel pleased to. 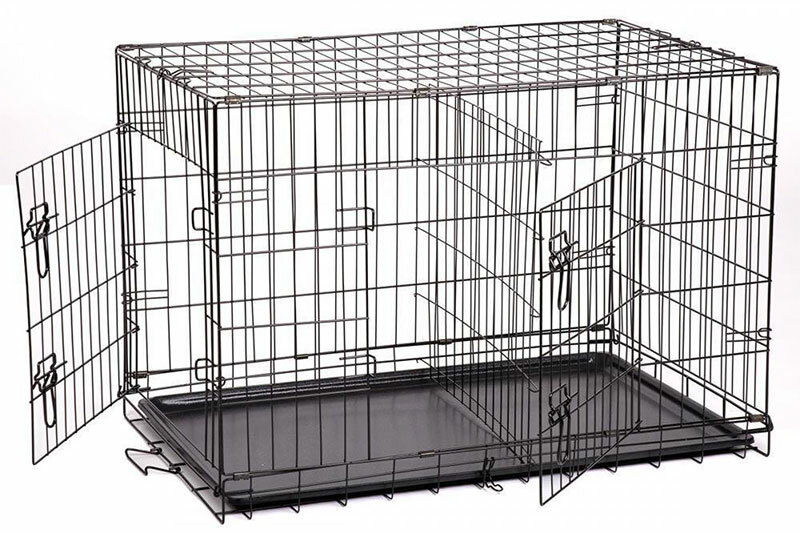 With the Carlson Pet Products Platinum Extra Tall Gate with Pet Door, your pets will stay still in one place. Let them play in the place where they are supposed to be. You can now enjoy doing all your tasks without worrying that they may destroy anything in the house. 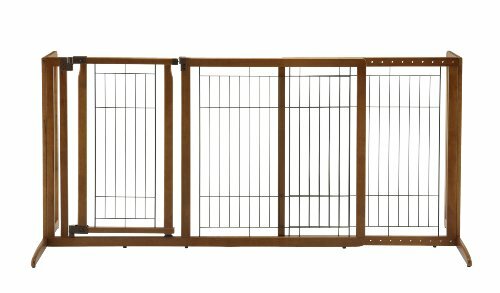 This Carlson Pet Products Platinum Extra Tall Gate with Pet Door is easy to use. With just one touch, you can release the safety lock and let your pets in and out of the gate. There is also a small pets’ door which makes it easy to let your small pets pass through and keep the big one inside. Alright, pet lover keeps your pets in their room safely by using this MidWest Homes for Pets Steel Pet Gate w/ Textured Graphite Frame & Decorative Wood Door. This pet gate is 39.125 high and can be expanded from 29.5 to 38 inches wide. It is designed with textured graphite frame and decorative wood door. This pet gate comes with a secure spring-loaded latch that can keep the gate safely closed when it is not in use. Please note that the gap between gate and latch will be eliminated when the gate is fully installed. The swing door is 19″ wide which makes it easy for your pets to pass through. With an auxiliary lock, it can be installed in any direction. The spacing between vertical bars of this swing door is 2.375″ wide. This pet gate includes 4 pressure/tension gate mounts that make you easy to install and secure the door easily. Moreover, there are two additional 3″ extensions and hardware for installation. This MidWest Homes for Pets Steel Pet Gate w/ Textured Graphite Frame & Decorative Wood Door is also provided with one-year Manufacturer’s Warranty. 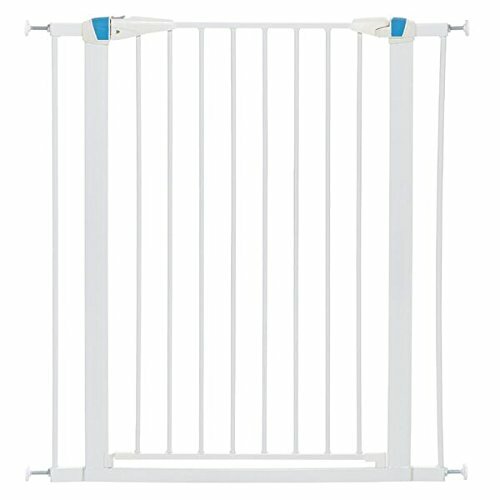 The Command Pet Tall Pressure Gate, 42″H/29″-32″W, White can help you keep your pets in a particular place. This pet gate can put your large and active pets from accessing off-limit areas in your house and other places. What so special about this pet gate is that there is a pressure-plus technology that forces additional outward pressure on the door opening to maximize gate stability after each use. It is easy to install with no damage to your house walls or your woodwork. You don’t have to use any extra tools when you install the door. This two-way door with one-hand operation ensures to corral your pets in their limited area. Say no more to damage furniture or other equipment in your house when you install this Command Pet Tall Pressure Gate, 42″H/29″-32″W, White. Buy this gate or buy a new set of furniture! Choose wisely! This pet gate in soft white & glow-in-the-dark phosphorescent night safety strips is 1D x 39.125H inches and can be expanded from 29.5 to 38 inches wide. This pet gate should be stored close to a light source during daytime so that it can illuminate at night. 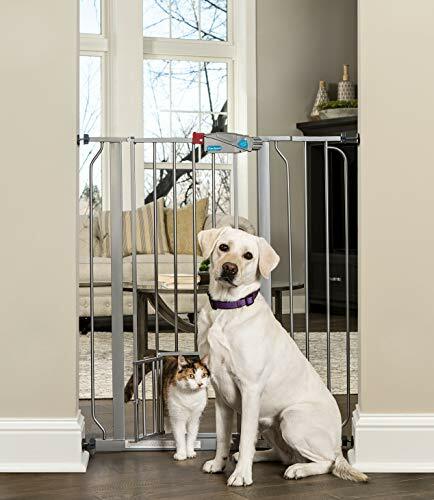 This pet gate can separate your room from your pets’ room so as to keep them safe, out of harm’s way and prevent them from making a mess around the house. Moreover, this pet gate features two glow-in-the-dark that are known as safety strips. These safety strips are on the gate frame. Its aim to provide additional safety and visibility at night for you and your pets. It is the one-handed operation with a secure magnetic latch that alerts pet parent that the gate door is securely closed. This pet gate is a safety gate which contains non-toxic, lead-free and chew-proof. With this gate, you can save up some money from your electricity expense. This will be your best choice ever. Save money as well as the environment. 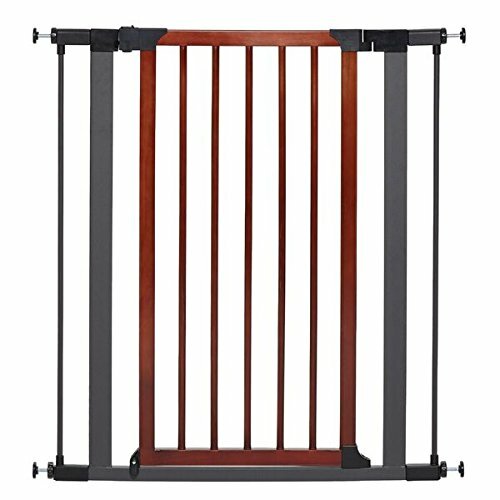 Richell Deluxe Freestanding Pet Gate with Door, Medium can fit doorway openings from 61.8-inch to 90.2-inch. 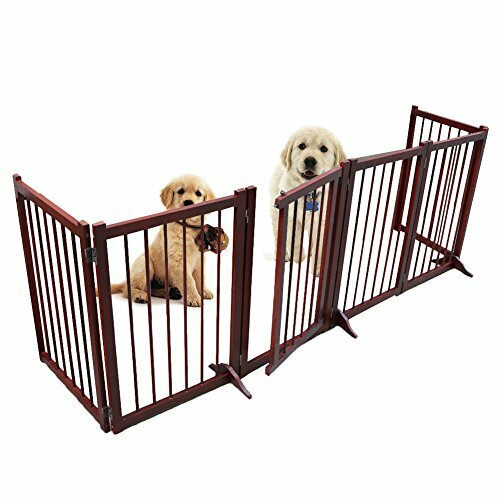 Its medium gate can stand at 28.1-inch high to accommodate your small to medium pets. The gate door can be locked at the top and bottom for extra security. This pet gate is specially designed with walk-through door opens in both directions. It locks automatically and remains open at 90 degrees to allow you to move freely from one area to another. And the side panels of this gate are designed to keep the gate from tipping over while the rubber feet keep it from scratching/sliding on hard floor surfaces. This pet gate is made of beautiful hardwood. You will surely love it. This pet gate is recommended for small to medium dogs 8.8 to 44 pounds (4-20 kilograms). The space between wire slats is 1 ¾ inches. The wire is 7 gage or 0.144 inches. The gate door opening is 19½ inches wide. It is made from rubberwood. Want a pet gate, but lazy to install? 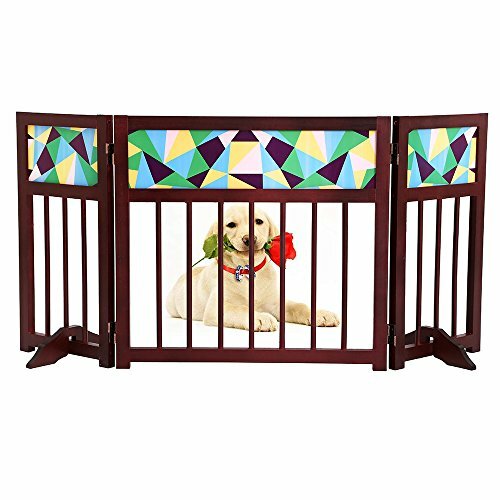 This Freestanding Wooden Pet Gate, 6 Panel Folding Wooden Fence, Dog Puppy Gate for Indoor Hall Doorway Stairs, Fits Small Medium Animals requires no installation. This pet gate provides a safe and efficient way to confine your pets while offering a decorative and handsome touch to your home. The gate is built with 6 separate panels secured together with sturdy hinges allowing the gate to fold out into many shapes configuration such as Z-shape, rectangle, and hexagon. The gate is free standing and could be used in front of doorways, entryways, halls, bedrooms, and staircases. This pet gate comes with a bolt and some screws. It helps to surround with a fixed hexagon and this bolt could be easy to open. You need to choose a right place then use screws to fix bolt. Once you placed it, you shouldn’t move it. If you move it, it may affect the appearance. Are you owning large pets and having trouble finding the pet gate that fits your pets? This Richell Deluxe Freestanding Pet Gate with Door, Large can accommodate medium to large size pets. This pet gate stands at 36.2-inch high and the doorway opening is from 61.8-inch to 90.2-inch. There are top and bottom locks for this gate so please don’t worry that your dog can escape from this pet gate. You can now concentrate on doing your work without worrying about anything. If you’re afraid that your pets may be bored, just give them some toys to play with while you’re away for work. This pet gate is highly recommended for medium to large pets 17.6 to 88 pounds (8-40 kilograms). It is pretty durable. Your money is worth spending on this pet gate. You will never waste your time and money to look for new things to replace the one that your pets destroy any longer. This Richell’s Premium Plus Freestanding Pet Gate with Door fits doorway and hallway openings from 34” to 63″ wide! The specially designed walk-through door opens in both directions and includes an upper/lower locking system to allow free movement and extra security! But that’s not all yet. This gate is designed with side panels to adjust in increments of 10° to allow you more options for using in your home! Moreover, it is very easy to adjust the gate to fit your personal needs! This pet gate is designed to help you keep your active pets in the place where they belong. 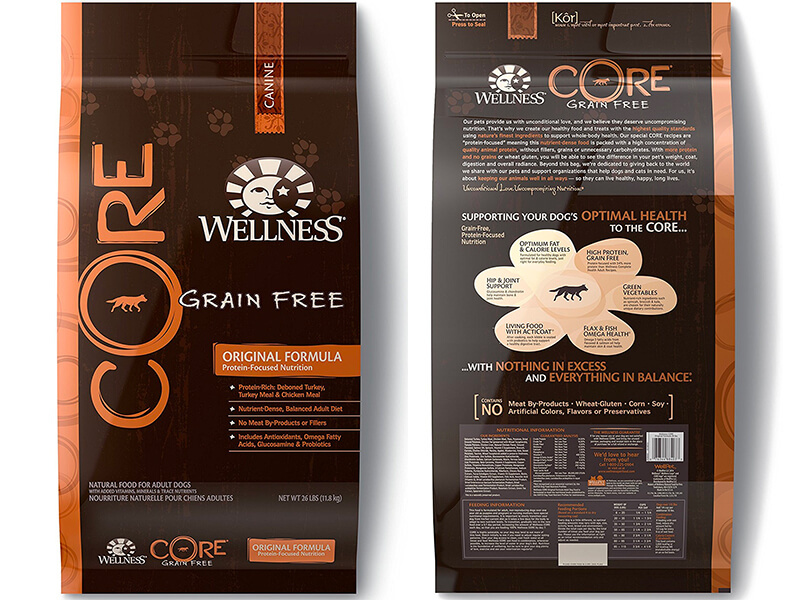 Your pets will be safe since they cannot run out to the street without your attendance anymore. Express your love and care for your pets through this pet gate. Please always keep your pets in this gate whenever you are busy and cannot take care them. Always keep in mind that safety first! 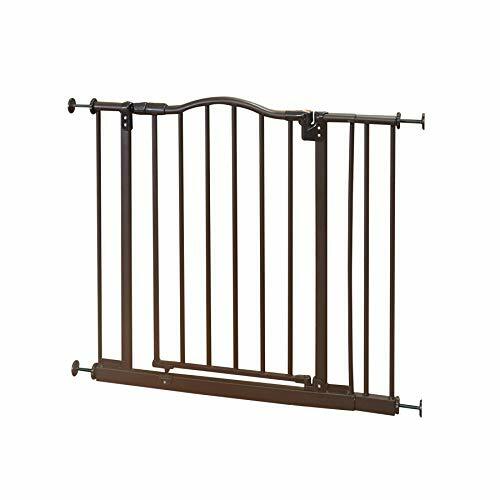 This North State Industries Windsor Gate adjusts to fit openings 28.25– 38.25-Inch-wide and is 28.5 Inch high. The gate swings can be open both ways for more convenience. The triple locking system of this gate is to provide extra security for your pets. The heavy-duty metal construction in a matte bronze finish will look good in any home decor. The wall cups are also included for extra strength. It can be shut firmly and easily with just one simple push, keeping your pet contained in a safe place. To keep the gate, open for multiple family members to pass through, simply use the hold-open feature to prevent the gate from closing. This gate pressure mounts easily by using tension knobs to secure the gate in place. It’s ideal for a variety of room openings or in doorways. Don’t forget to get to check the box when you purchase it. Make sure there are one pre-assembled gate panel, two extensions, a hardware packet consisting of four bolts with tension knobs, four extension pins, four mounting cups, four screws, four double-coated tape pads, one wrench, and an instruction manual included in the box. 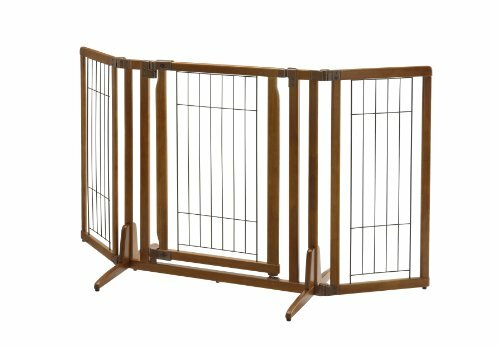 This freestanding pet gate is built with 3 panels secured together with sturdy hinges allowing the gate to fold out into many shapes configuration such as Z-shape, U-shape. The open-size of this gate is 47.2” Length * 0.79” Width * 22.1” Height and the Collapsed size is 23.6” Length * 0.79” Width * 22.1” Height. It’s weight: 8.46 lbs. It’s easy to store in slim and narrow areas when not in use. There are 2 support feet included in the package to provide extra stability and prevent tipping. It requires no installation. This pet gate provides a safe and efficient way to confine your pets while offering a decorative and handsome touch to your home. 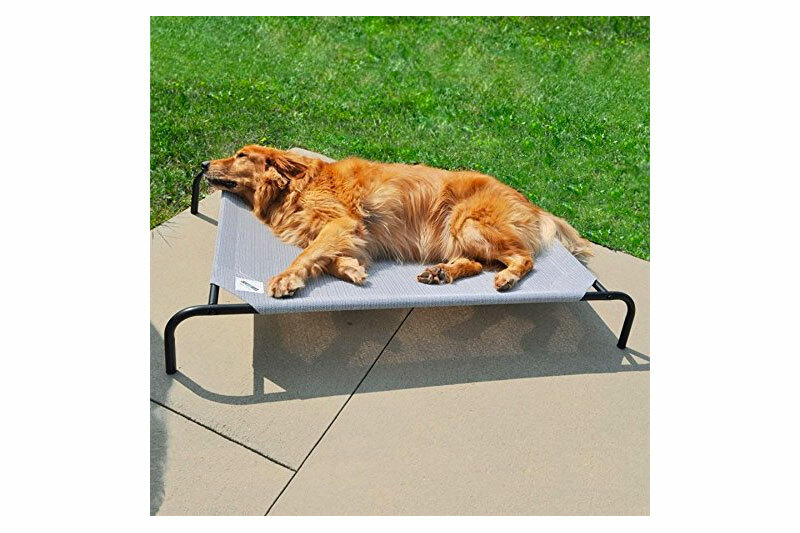 Just a short reminder, this product cannot completely prevent pets from passing through so please do not place the gate in a location where passage through could lead to danger. Pet gate is necessary when you have pets in your house. Pet gate does not only prevent your dog from chewing all the stuff in your home, but it also helps to keep your pets safe. Keep them in the pet gate when you’re working; get them out of the gate and take them for a walk when you’re free. 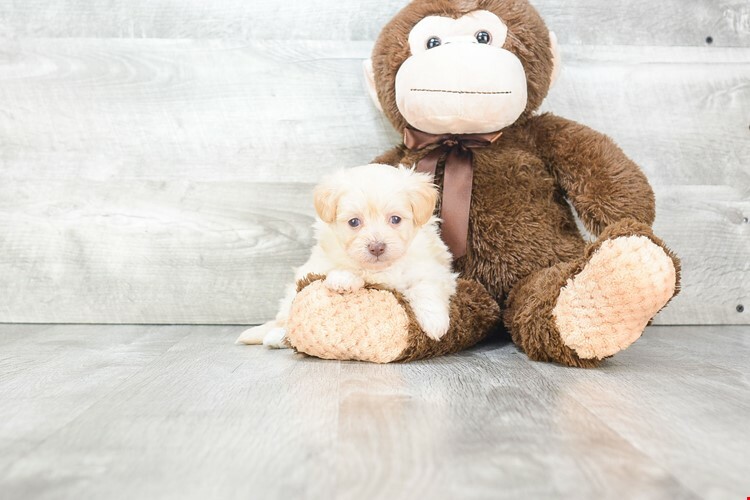 What is Maltipoo Temperament and What are their Main Characteristics?